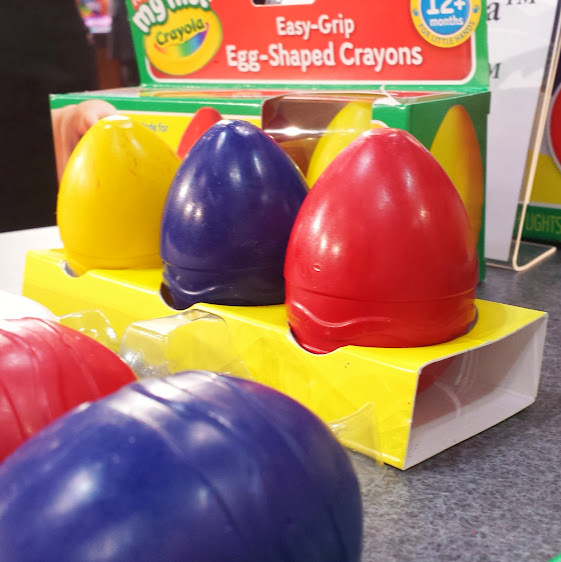 Toys As Tools Educational Toy Reviews: Toy Fair 2014: Be Smart, Make Art! I really don't know hence I'm asking. One thing I do know is this: We don't have enough of it in our lives. 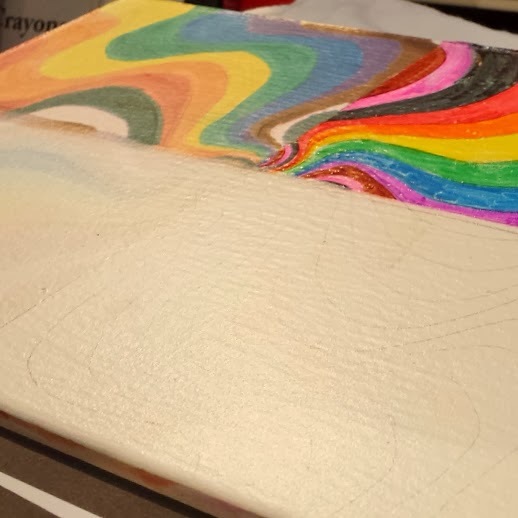 Even as a parent, I have had to let much go because I've been afraid of staining or breaking but thankfully, I've found some wonderful toys that double as artwork so we're finally okay in that department. That said, I think we still need to expand our ideas on what art is- especially in schools. For example, my son is very much a 3D thinker and maker but I can't remember the last time he's brought home an art project in 3D. Things that you might consider to be "building toys," might be seen in this post. In this space, I'd like to think of them as "sculpture toys" because we need to allow our builders to tickle their design bone as well as test their structural know-how. 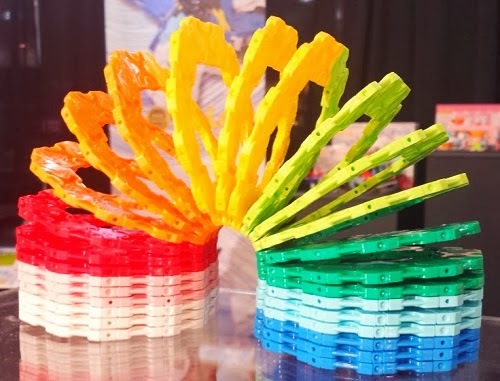 I know that so many of us are talking about building toys for girls but I think we can also create more access to building toys for all kinds of kids if we were to look at them also as a medium for sculpture. If you want to know where I thought of this, I would have to say that it probably came from viewing The Art of the Brick Exhibit by Nathan Sawaya whose work is all about taking LEGO bricks and creating amazing sculptures. Sawaya recently started a foundation called Art Revolution. 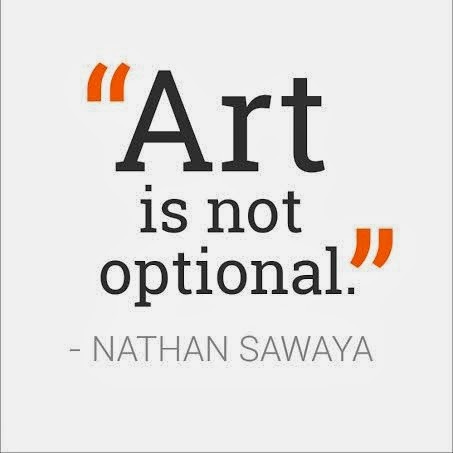 In his TED Talk and on the website, he states emphatically that "Art is not optional." Read the report on why children need art. Toys Are Tools readers chose the QBA Maze Mega Stunt Set by Mindware as their favorite. Now, there are new pieces added to make the experience even more fun. I know that people classify this toy as a marble run but you know... 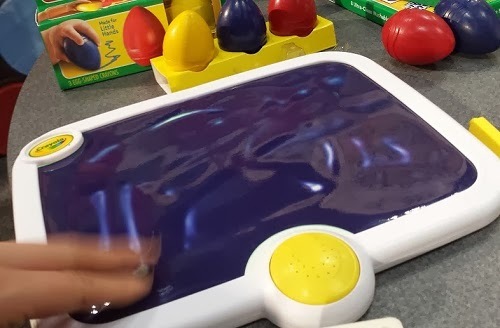 It's a sculpture toy too. 1st Grade Teacher Annie Kim dropped the marbles into the maze and agreed with me, this toy is very constructivist in nature. 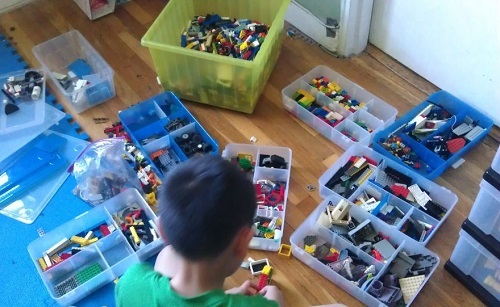 Kids set their own level of difficulty - the mark of a good toy. It's like a candy store. Choose your own Plus Plus? That's a big plus! "Ultra-Clean" is new. Even more washable than before. A demonstration on a wall sample (yes, actual wall) shows the difference after washing. Hmmm... Where were you when Tester 1 was 2 years old? 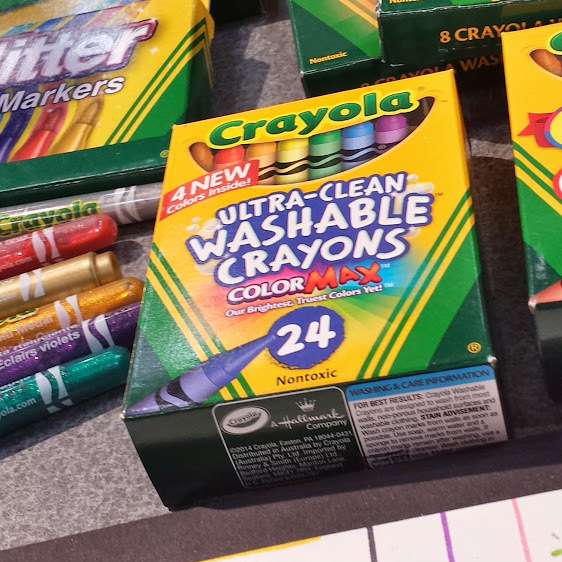 Crayola is allowing kids to make sophisticated art that appeals to grown-ups too. Neat! I think this is so cute. Use the shapes to help kids draw. Like stencils but more user-friendly. New from Crayola. This teacher loved this drawing helper tool. Wow! We were both amazed. She was so excited about the Crayola booth. Any OTs in the house? This one's for you. It's sooooo gel-ly. Stealing this crossed my mind. It probably crossed Teacher Annie's mind too. There are light and sound components should you choose to use it. Melissa and Doug is such a big name. I had to think about this for a while but I realized that I have never tried more than one or two of their art products... And obviously they have a lot! That pencil sharpener looks very cool. Yes, I take my pencil sharpeners very seriously. I think felt is so fun. And I have fond memories of those cutting fruits and veggies. I remember setting them up for my kid and he would cut them up so fast. How tiring but I was happy he was happy. My neighbors remember the days when I used to do glitter tattoos as a school fundraiser. I made hundreds of dollars. This is before they were widely accessible. Good news is that these templates are reusable! Woo-hoo! Thank you Alex Toys! I think that when you can do it, you should always go for quality materials. This is one of the many reasons I love eeBoo. It reminds all of us to be a bit more thoughtful. 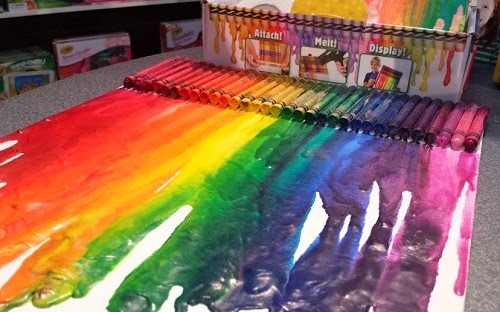 Using great materials also makes art-making so pleasurable. Everytime I walk into a neighborhood toy store, I am often heading straight to the eeBoo products. I just love to stare and feel them. It's very hard to walk out without something eeBoo in my hand. I have one of their sketchbooks and diaries. They are terrific. The sequel to Design Tiles. I have never been big on quilts and such but I'm really looking forward to this! Why? Something tells me that this is even more challenging than design tiles and that I will learn to be a more stylish dresser, a better website designer, a better interior designer of my home. Oh, the kids? I see it helping on multiple fronts too but yes, definitely make him learn how to "dress for the occasion." This is a huge social skill, is it not? Wait for my review so that I can explain what I mean about this. I bet quilters get this quite quickly though! This is LaQ from Japan. It's quite popular there. Sometimes I see it in Toys R Us and at Japanese bookstores when I am itching to buy an expensive pencil. 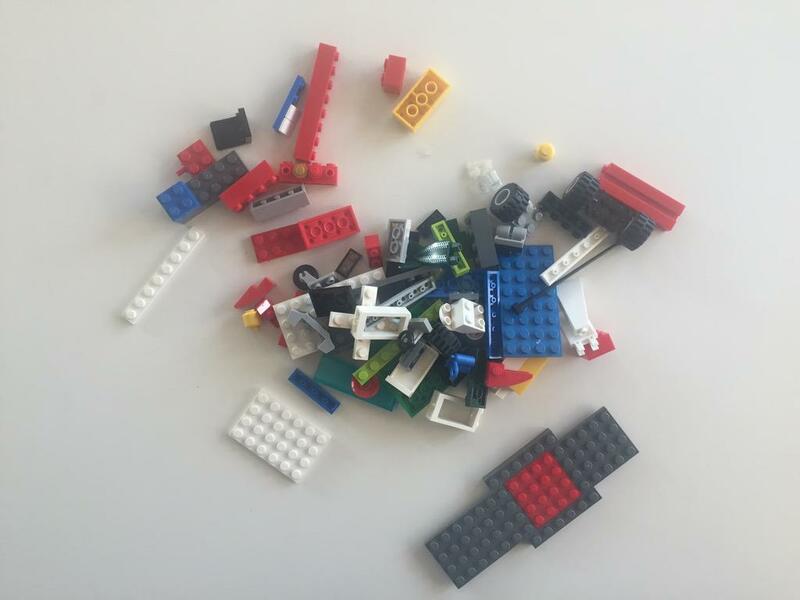 The pieces can make objects big and small. And it totally worked like a slinky too. I had no idea that LaQ could be used this way. Funnybone Toys will soon bring to us Rolli. It is just so fabulous. I want kids to make their own stationery. It's so easy to do with this and the colors are gorgeous and it doesn't run. 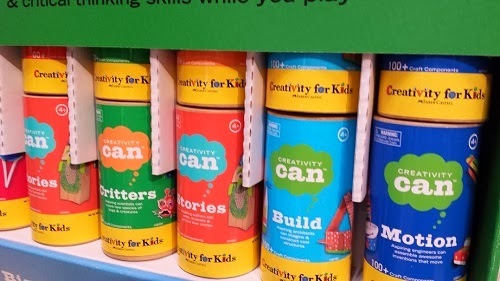 A can for every inclination? Love it. 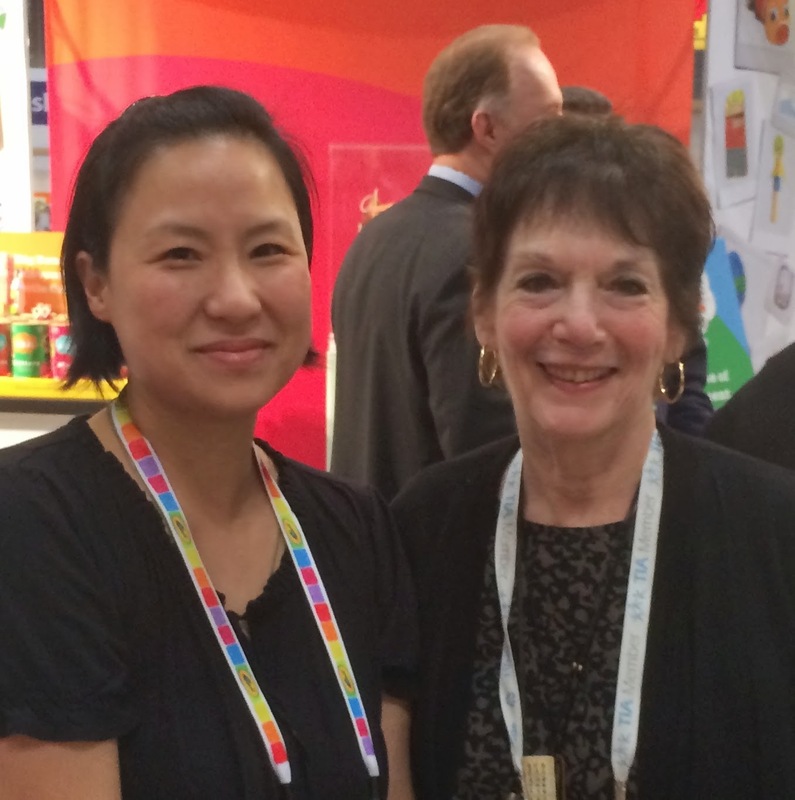 I asked co-Founder of Creativity for Kids, Phyllis Brody to take a picture with me. My mom always tells me to hang out with the smart people. By the way, whenever a child uploads one of their creations, Creativity for Kids will make a donation to support art education in underfunded public schools. You can make this loopy tubes the frostiest shade of pink and my son will still love it. 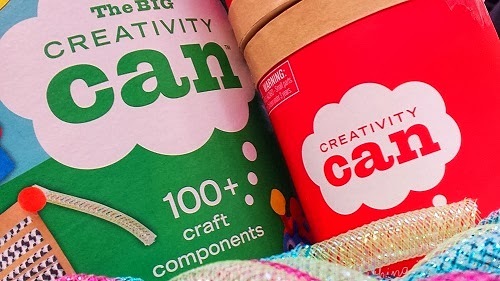 Faber Castell has new markers that connect to build... animals... yes! 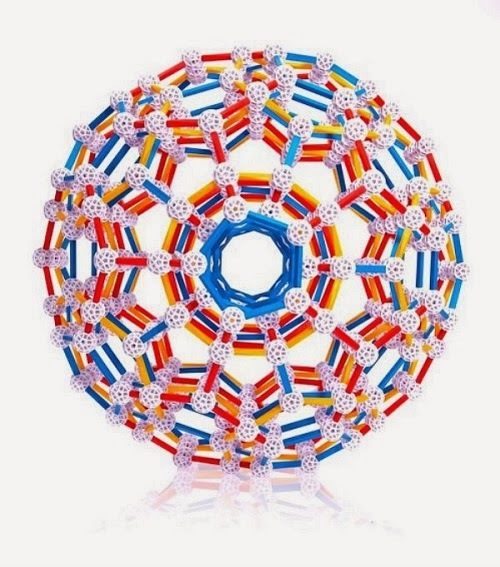 One of Creativity for Kids' products from the past. 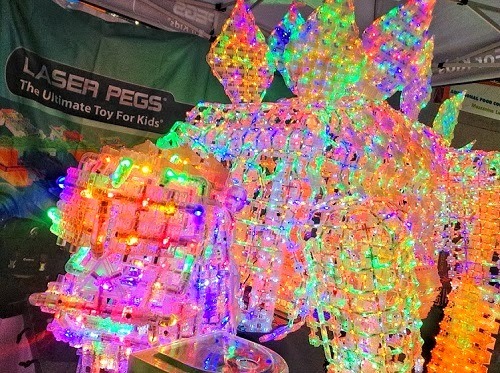 I used to think Laser Pegs was another building toy except with lights but now I look at it as a sculpture toy too. And you are not sculpting just a structure, you are sculpting with light. Light is defining the structure here. I think this is quite the challenging toy. It's taken me a while to figure this out. Wow! Mixels will be a hit at our house! They already build similar creations.